They are designed to operate at pressures more than 15 psi, and are made of a variety of metals, high-strength plastic or fiberglass. The tanks are usually cylindrical in shape with a horizontal or vertical orientation. 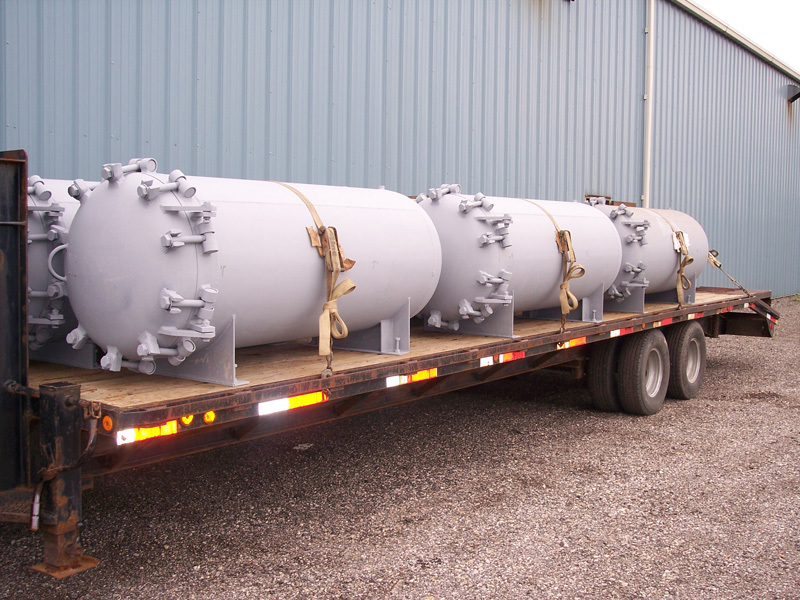 Air Pressure Tanks – Gladwin Tank Mfg., Inc.
Air pressure tanks are orientated either horizontally or vertically depending on the substance being stored and the available space. Other storage options include being used for long or short term substance storage, allowing the mixing of chemicals, or chemical reactions underground, less secure storage above ground, or on the back of large trucks or inside an industrial facility. The design, production, use and maintenance of high pressure vessels are all controlled by the American Society for Mechanical Engineers, who put forth a set of quality and safety standards for pressure tanks. As even the smallest leak or split seam could cause a catastrophic explosion, the ASME standards are stringent and for optimum safety, should always be followed. ASME tanks are used in many industrial applications within the food and beverage, cosmetics, pharmaceutical, plastics, chemical fabrication, heating and filtration industries. They store, mix, act as reactors and are able to heat and cool a wide variety of substances. 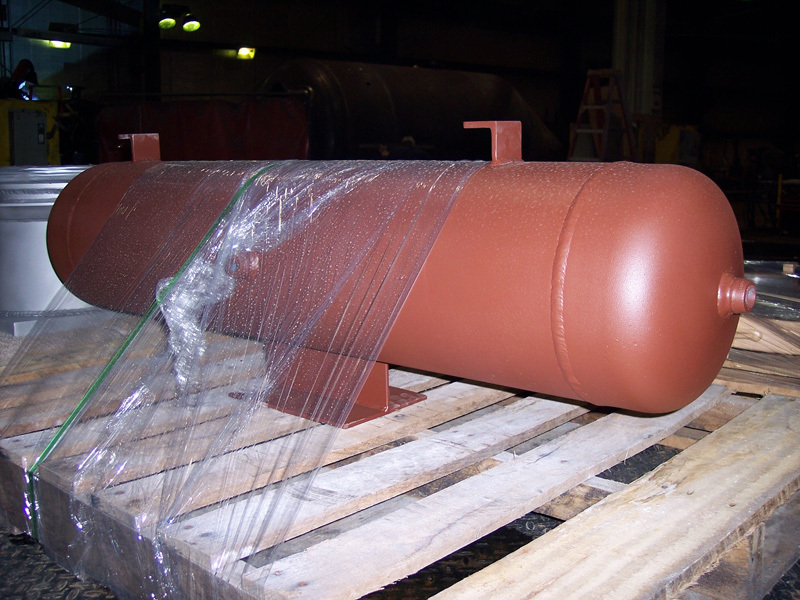 Manufacturers of air pressure tanks, often called pressure vessels, fabricate a range of different tanks; from a few hundred pounds per square inch (psi) to up to 150,000 psi from strong metals such as carbon steel, titanium, aluminum or stainless steel. The tanks are usually engineered using one of three processes- forging, welding or brazing, all of which involve heating pieces of metal and joining them together. Large cold rolled pieces of metal are usually bent into the round shape and then joined. Forging is the process of forming the metal parts through the application of heat and pressure. Welding involves melting two similar metals together by heating their edges until molten. And during the brazing process, the metal pieces are joined by filling the space between them with a nonferrous metal. Before fabrication, most of the metal has been cold rolled, which creates a stronger metal than hot rolling. The tanks are also often galvanized, quenched or tempered to increase their temperature resistance and tensile strength. Testing of the pressure vessel ensures design technique consistency, proper vessel operation and certification approval. Regular inspection remains necessary to ensure that the vessel continues to meet industrial standards and safety requirements. Air Pressure Tanks Pressure vessels, often referred to as air pressure tanks are used for the storage and containment of fluids, vapors or gases at pressure levels greater than that of atmospheric pressure.